This "Historically Speaking" column appeared in the Exeter News-Letter on Friday, March 1, 2013. 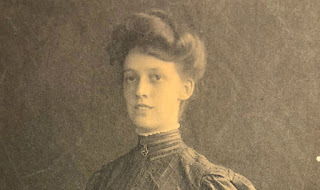 In October of 1908 the new managers of the Exeter Opera House announced that they would re-open the theater with the latest technology in entertainment – motion pictures. The Opera House, which stood on Water Street where the Folsom Tavern stands today, had originally been a Baptist Church and the town armory. In 1887 the building was repurposed into a theater – presenting the usual fare of vaudeville, concerts and magic lantern shows that were popular at the time. In spite of its rather high-class name, the Opera House frequently had to assure townsfolk that the entertainment was wholesome and appropriate for patrons of all ages. In the years that followed, there were often special showings of movies in town. Unity Hall on Elm Street and the Town Hall were frequent locations for viewing movies. Whether the equipment was rented from out of town or borrowed from the Opera House is unknown, but certainly acceptance of the new media was growing. 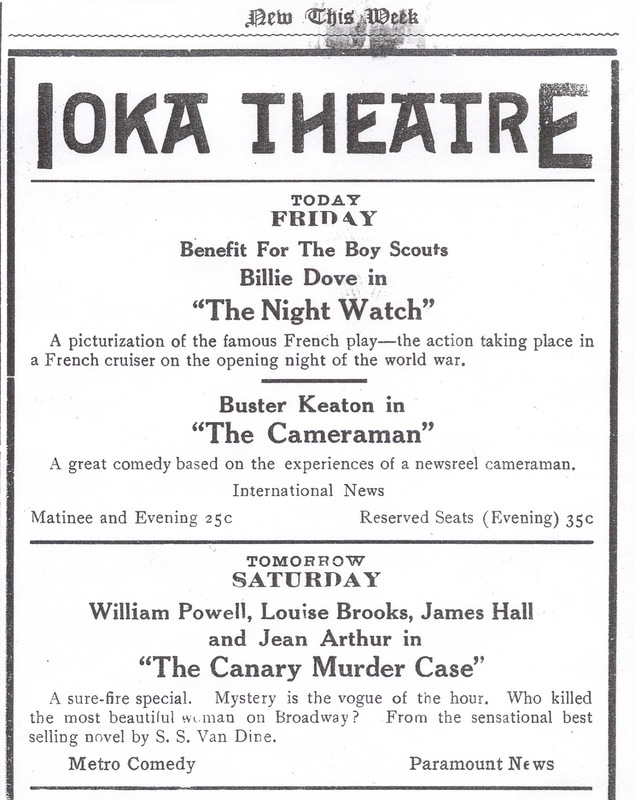 In 1915, local judge Edward Mayer began construction of the Ioka Theater up the street from the Opera House. It opened in November to great fanfare with a special presentation of “Birth of a Nation” – a groundbreaking if controversial film. The film, with its skewed depiction of the South during reconstruction, veneration of the Ku Klux Klan and actors in blackface, was banned from many cities. 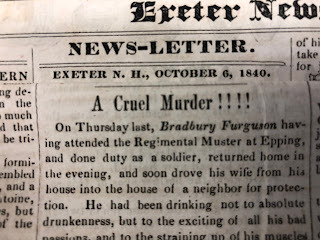 In smaller locations, like Exeter, the film was forgiven for its many, many faults because nothing like it had ever been seen before. With a run time of two and a half hours, it was eight times longer than the average movie. It was almost like going to see a play – except that it was a motion picture – who could imagine such a thing? The Ioka, with its plush new seating quickly put the Opera House out of business. Unlike the Opera House, the Ioka was designed for motion pictures and only occasionally served as a venue for other types of performances. For nearly twenty years movies shown at the Ioka were silent. The first talking picture shown in Exeter was “Should a Girl Marry?” shown on March 19, 1929 with six other short sound features. Like “The Jazz Singer,” which was released two years earlier but does not appear to have been shown in Exeter, this film was only partially sound with whole segments that were still silent. The sound must have been jarring when it intruded into the film. “The Cameraman” tells the tale of poor tintype photographer who falls madly in love with an MGM employee. To win her love, he decides to become a newsreel photographer in spite of the fact that he does not know how to use a movie camera. Hilarity ensues as he bumbles his way through his first few attempts and later gets caught up in a ‘Tong war’ in Chinatown. Unlike many actors of the silent era, Keaton managed to make the change to sound pictures by adapting. He continued to write, direct, act and produce his own films, although not quite to the level he wanted. The Ioka too, adapted to sound. Throughout the 1930s and 40s, the Ioka flourished, upgrading its sound system numerous times. Within a few short years, moviegoers completely lost their love affair with silent films. Watching one today takes one back in time to when the Ioka was the best show in town. 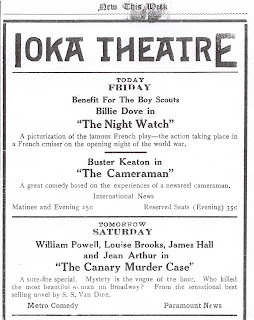 The Exeter Theater Company is holding an event, "IOKA's Silent Film Night: Buster Keaton Double Feature", on Saturday, March 9, 2013 at 7pm at Town Hall. See http://bit.ly/WNqJMq for more information.